ICanFixUpMyHome | How to Install Closet or Alcove Shelves | Increase your storage space with this easy woodworking project. © 2010 by Kelly Smith all rights reserved; content may not be copied, rewritten, or republished without authors written permission. 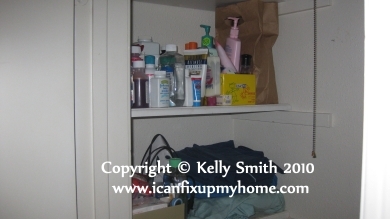 There never seems to be enough storage space in closets and alcoves. Likewise, many people acquire collectibles as a hobby. Eventually the display space runs out. Some alcove shelving might be just the answer. Another situation is storing all that bulky winter clothing. Adding more shelving is an easy woodworking project and can be much more economical than buying plastic or wire shelving from Walmart or Home Depot. Since were working with small spaces, we can rely on the support of three walls to make a sturdy storage surface. A circular saw or a table saw. Corded or cordless drill with bits and a #2 Phillips screwdriver bit. 2 level or laser level. Tape measure or carpenters folding measure. 1 X 2 boards or furring strips. Were not talking about your baseball shoes here. These cleats are the 1 X 2 (2.54 cm X 5.08 cm) boards mentioned in the material list. Theyre installed horizontally and support the shelf. Well be installing 3 of them per shelf, one spanning the rear wall and one on either side wall. Decide on the height that works best. Dont forget that the thickness of your shelf material is important since the finished horizontal surface will be that much taller than the upper edge of the cleats. Carefully measure the length of the back wall and use your saw to cut a cleat to fit it. Set the cleat in place and hold your level on the bottom side. Adjust it until its level. Draw a reference line with a pencil along the upper edge of the cleat on the wall. Lay your cleat aside. Use your stud finder to find the wall studs and make a corresponding small pencil mark just above the reference line. Place the cleat back on the wall, mark the stud locations on it, take it off and drill pilot holes. Now use the drill and screwdriver bit to secure the cleat to the wall. Repeat the above steps for the remaining 2 cleats. As you probably know, with residential wood framing, drywall corners are rarely square. Because of this, well check the 2 corners at the top of the cleats with a sliding bevel. Hopefully, it will be close enough to square that the shelf can be cut that way. Remaining gaps may be covered up later with paintable caulk. If this isnt the case, you can use the angle found with the sliding bevel to cut the shelf to fit closely. Cut the shelf and install it. Many times, it can just be set in place. Otherwise, drill a couple of pilot holes on each side and secure it with screws. Finally, do any wood putty work, then prime and paint the wood.